Painted in 2016 by Mario Labonte. The vistas from the shores of Vancouver Island have always captivated residents and visitors alike. The Arbutus trees featured in this mural are native to the Pacific Northwest. The tree is the only broadleaf evergreen tree in Canada. It was important to the Coast Salish First Nations, who used its leaves and bark to create medicines to treat stomach problems, wounds and colds. The berries were an important ingredient in many foods eaten by Northwest Coast First Nations peoples. Artfully hidden in plain view is a face of clouds and leaves; the artist’s expression of the interconnectedness of everything. 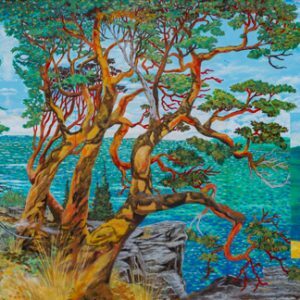 This mural contains a reproduction of Emily Carr’s Chemainus Bay.